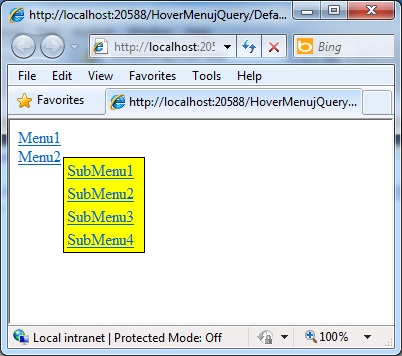 Here, I am reading the form values, using jQuery.and posting form values to Web API for saving on the database. The output of the Application is: After saving the …... I'm trying to add a delay to my menu so that when you mouse off of a menu item, the subitems don't hide for a set number of milliseconds. I tried using a setTimeout function, but that doesn't work, because once you mouseLeave the .linkLevel1, I can't use $(this).find anymore, and thus can't hide .menuLevel2. I'm trying to add a delay to my menu so that when you mouse off of a menu item, the subitems don't hide for a set number of milliseconds. I tried using a setTimeout function, but that doesn't work, because once you mouseLeave the .linkLevel1, I can't use $(this).find anymore, and thus can't hide .menuLevel2.